How would you like 6,429,784 people turning up on your blog in one day? Well, according to Quantcast, that’s what just happened on Oct 17th, 2012 over at the blogging network of Tumblr. A record high! In fact that day they had 231,864,992 page views IN ONE DAY!!! and 1.6 TRILLION in that week. Crazy numbers for a simple blogging site, right? Yes I know, sites such as Twitter and Facebook smash these numbers, but they have different purposes when it comes to customer generation and retention. With this in mind, what I'd like to remind you is that owning a blog and publishing content to it can be far more superior than these gigantic social media sites in many ways. Now don’t get me wrong, I’m not saying you should do one or the other, in fact the two combined can be part of a VERY VERY powerful social strategy. 1. Build Your Brand As An Expert: As an individual or company either in business or just out to influence others or just have a voice. 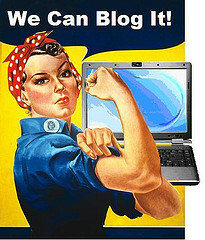 Blogs allow you to be heard, share ideas, educate, and influence trends. Here you are able to put your real talent and knowledge on display for the world to see. The key here is to remember, being an expert and being branded as one isn’t about talking about yourself, as if that’s all you do, I’m sorry my friend, but in this social world you won’t survive long. Educate, influence, and share your knowledge and great content in areas others are looking to grow, and your brand will naturally grow with you. 2. Build Trust: When people find you for the first time they will be skeptical... It’s the Internet! So creating a blog with consistent, helpful, truthful content will help build the bridge of trust between you and your new and current readers. Yes, these seem like simple things but you would be surprised how many sites don't even have the basics. Don’t limit yourself to just educating folks. You can keep readers up to date with trends, new products, technologies and position yourself as the expert who is in-the-know. 4. Organic Search Traffic: - It’s been proven. Businesses that actively blog get 6.9 times more unique traffic to their website and in general get 55% more visitors overall. Consistent blogging will drive more traffic to your site, and more traffic going to your site means more leads...and if you follow the simple rules of consistent, helpful and truthful content, they are going to learn more about you. So look at it like this, the more you write, the more traffic you will get, and then the more you write, the more likely you will have the answer to readers' questions when they find you. 5. Consistency: How would you feel if you local newspaper published the news sporadically? What if one week you newspaper was delivered daily and the next week it wasn't delivered at all? There is no correct answer as to how many posts you should post a month. But the more the better in many cases. All we ask is if you can only do 2-3 a month, keep it that way. If you can do 1 a day, great, but just be consistent. If you haven’t started a blog, start one, if you already own one, keep at it and keep educating. Blogging is still one of the best tools in your SEO toolbox, a great way to make money and a great way to brand yourself as an expert. No matter where you are either first blogging day or 900th. Make sure you are true to these 5 goals and continue to build a focus on a blog that is profitable and remarkable.